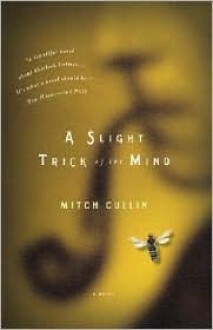 Mitch Cullin’s engrossing A Slight Trick of the Mind is an original portrait of literature’s most beloved detective, Sherlock Holmes, in the twilight of his illustrious life.Holmes—“a genius in whom scientific curiosity is raised to the status of heroic passion”—is famous for his powers of deduction. His world is made up of hard evidence and uncontestable facts, his observations and conclusions unsullied by personal feelings, until novelist Cullin goes behind the cold, unsentimental surface to reveal for the first time the inner world of an obsessively private man.It is 1947, and the long-retired Holmes, now 93, lives in a remote Sussex farmhouse, where his memories and intellect begin to go adrift. He lives with a housekeeper and her young son, Roger, whose patient, respectful demeanor stirs paternal affection in Holmes. Holmes has settled into the routine of tending his apiary, writing in journals, and grappling with the diminishing powers of his razor-sharp mind, when Roger comes upon a case hitherto unknown. It is that of a Mrs. Keller, the long-ago object of Holmes’s deep—and never acknowledged—infatuation. As Mitch Cullin weaves together Holmes’s hidden past, his poignant struggle to retain mental acuity, and his unlikely relationship with Roger, Holmes is transformed from the machine-like, mythic figure into an ordinary man, confronting and acquiescing to emotions he has resisted his entire life. This subtle and wise work is more than just a reimagining of a classic character. It is a profound meditation on faultiness of memory and how, as we grow older, the way we see the world isinevitably altered. I did enjoy the character of the elder detective in this short novel, but am not sure it fits Sherlock Holmes. The story threads seem disjointed until the very end, which is fitting I suppose, but this novel just wasn't my cup of tea. I liked this take on Sherlock Holmes. It made me laugh out loud in spots.